Subway tile is not just for underground subways anymore! Originally used in the New York Subway tunnels dating back to 1904, these tiles are making their way up from the depths and into our homes. Subway tile has been popular in houses in the past and is becoming a recent trend yet again as homeowners and their decor style move more towards the classic and clean-lined. Subway tile comes in assortment of sizes, colors, materials, and finishes. Glass, stone, metal, marble; from frosted to clear, from every shade of white you can think of to the brightest reds and blues, and everything in between. Its sheen adds a senses of brightness and cleanliness to any space and the classic lines keep from distracting from the rest of your design. Seeing this type of tile in a home automatically draws me in and waves of nostalgia of a simpler time come over me. 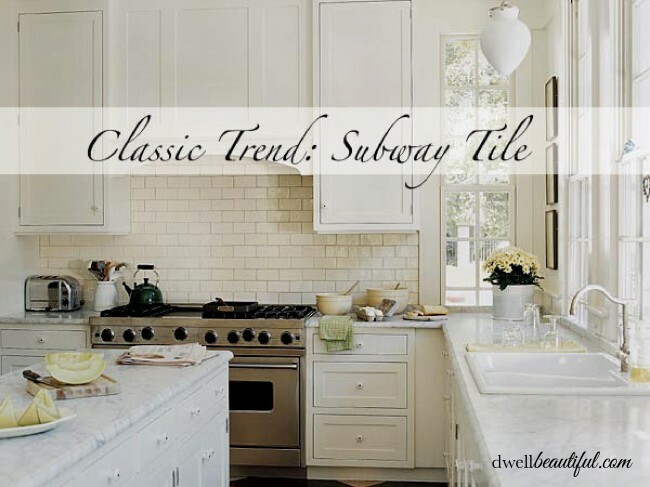 Classic white subway tile takes me to the 1920s and 30s and provide a sense of simplistic elegance. It is timeless and transcends a lot of the more popular come-and-go type trends. You can’t go wrong with anything that is classic and clean! My two favorite spots for subway tile to be used: the kitchen and the bathroom. In the kitchen, subway tile is a great way to add calm to an otherwise busy hub of home, and is functional in making kitchen cleanup a breeze. In a lot of cases, traditional white or neutral glass tile is used, however colored tile can be used to add a great pop to an otherwise white kitchen space. Metal or metal-appearance subway tile is also a great and upcoming option for those who prefer a more modern look. Use it in just an accent area or tile your whole kitchen – either way makes a big statement. Below are a few photographs for inspiration of how you can use subway tile to add to the design interest of your kitchen! In the bathroom, subway tile is a great way to make a small powder room feel large or add a pop of color to an otherwise dull place. The bathroom isn’t a very exciting place in general, so why not jazz it up with some beautiful tile! Again, there is the immense functionality which makes clean up a snap. Use it in just the shower or above the sink or tile all the walls with it! Tiling up half the wall and leaving the space above for a fun paint color is a great choice that still adds drama without being overwhelming. The configuration and how much you use is totally up to you! So what do you think of Subway tile? Classy or tacky? Love it or hate it? Sound off in the comments below!